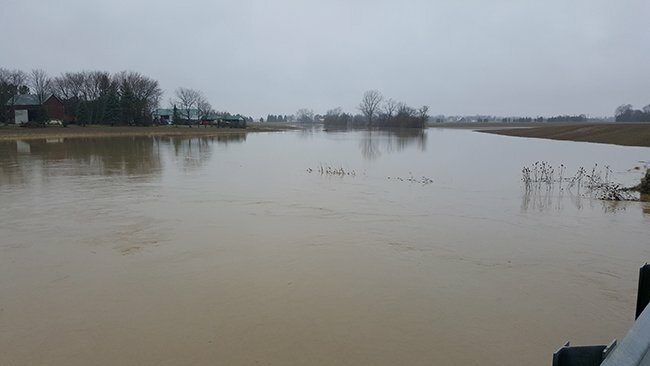 The Thames River watershed has received 20 to 75 mm of rainfall over the last 24 hours with the majority of the rainfall occurring in Chatham-Kent and the County of Essex (45 to 75 mm). Due to the amount of rainfall within a relatively short time period, localized flooding is occurring on area watercourses. McGregor Creek has climbed approximately 2.6 m over a nine hour period at the Highway 40 gauge station. Indian Creek in Chatham has climbed at about the same rate. Both creeks have yet to peak. Because of this, the LTVCA had to close the dam at the head of the Indian-McGregor Creek Diversion Channel to protect the south end of the City of Chatham from flooding. All water coming from the McGregor Creek watershed is now being diverted around Chatham into the Thames River. Only water from the Indian Creek watershed is flowing through the City of Chatham. Minor amounts of rainfall are predicted for this afternoon. However, in thunderstorm areas the amounts could be greater and further contribute to flooding. LTVCA staff will continue to monitor the situation and re-open the dam when the risk of flooding on the south side of Chatham is gone. People should take extra caution and avoid the shoreline, river, ditches, and streams. The combination of slippery banks and fast moving cold water can be dangerous. Standing water can also present its own unseen hazards. Children, pets and livestock should be kept away from the water. This message will be in effect until 15 May 2018.